The saying goes that cooking is an art and baking is a science. While it’s cool (and encouraged) to experiment with substitutions and different amounts when making, say, tacos. It’s maybe not the best idea to try too many crazy things the first time you try croissants. When I started Macheesmo, baking was my weakness by far. I just couldn’t really wrap my head around how things worked. What’s the difference between instant yeast and dry yeast? How about bread flour and all-purpose flour? I thought laminating had to do with making fake IDs. In fact, in the early days of Macheesmo I posted very few baked goods just because I wasn’t sure they were good enough to post. But as I did it more, I realized that I could completely handle baked goods and started getting more confident. So I thought I’d take a post and go over some tips that I wish someone would’ve told me two years ago! Let me start this list by saying I’m very far from a professional baker. I’ve never been to culinary school. I’ve only been to the airport in Paris. That said, I’d firmly put myself in the advanced home baker category. I frequently make homemade bread that I’m really proud of. I’ve done enriched breads, donuts, pretzels, bagels, and even experimented with a sourdough starter. The one area that has eluded me so far is laminated items. I just can’t get croissants down, but mastering them is in my future. I can feel it. Here’s a few things, in no particular order, that might help you become a better baker. This was probably the biggest change I made to my baking. I got a cheap digital kitchen scale and started weighing my ingredients instead of measuring them by volume. In reality, I only weigh flour and sugar really, but it makes a huge difference in making sure you get the same results time after time. The other nice thing about having a scale on hand is that it makes it a lot easier to half recipes. Say you want to halve a recipe with 3 eggs in it. This would be a guessing game without a scale, but with one it becomes pretty easy to weigh three eggs, scramble them together, then weigh out half the amount. There are some ingredients in the baker’s arsenal that I never really realized could go bad. And the thing is, they don’t really go bad, but they do lose their potency. What this means is that you could use them and they will seemingly perform okay, but they won’t have the same power as fresh ingredients. Yeast is the most obvious ingredient that can become inactive. Luckily, it’s pretty easy to test your yeast by putting it in some water with sugar before baking. If it bubbles and foams, then you’re in business. The harder ingredients are things like baking powder and baking soda. Those really need to be replaced every six months or so. I love my stand mixer as much as the next person, but I still make bread by hand pretty frequently. I think it’s really important if you want to learn to make bread to know how it feels. It may sounds cheesy, but as you work with the dough, you start being able to tell subtle things about it. Is it too dry? Too wet? Is it ready to rise or does it need to be kneaded more? These things are kind of hard to tell in a stand mixer as it whips the dough around at 90 miles an hour. Making bread is an old school hobby and sometimes you need to go old school on it. So unplug the stand mixer and start kneading! Not only will you become a better baker, but you’ll get a bit of a workout also. If you’re new to cooking/baking, you’re going to need to learn a bit about baking essentials before you can really become a proficient baker. Have no fear though. This isn’t organic chemistry (although there is some chemistry). Eventually, you might want to graduate to an actual baking textbook (I’m almost there), but for starters, here’s a few great books that not only give solid recipes, but explain the processes and science behind baking. Baking From My Home to Yours, by Dorie Greenspan. You’ll notice that I didn’t include in this list that you need to spend thousands of dollars on equipment. Of course, you’ll need some equipment, but nothing too expensive. Good bread was being made before professional mixers and gadgets so I encourage you to give it a shot without those things first! What are your tips? I know I have a number of really good bakers that read Macheesmo, some are professionals. 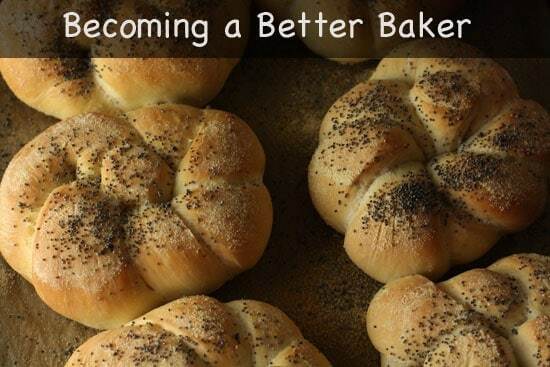 What are your tips for people that want to become better bakers? I heard two great tips from Nick Malgieri (otherwise known as "the man" to most bakers). First, pre-measure ALL your ingredients before you start anything. You'll know that you aren't low on anything, and you will be far less likely to mis-measure or omit anything. Second, unless another temperature is specified in the recipe, all ingredients should be at room temperature. This ensures a better mixing process. Just had pizza dough go entirely off the rails this weekend due to some of these exact reasons. Dry yeast instead of instant yeast? Check. Half whole wheat flour instead of bread flour? Check. Measurement by volume instead of weight? Check. Doughy, dense, disappointing result? Check, check, check! The irony: backup for a failed recipe is always, of course, frozen pizza. I very often will start bread in the stand mixer, but once it all comes together, I'll finish the kneading by hand. I agree that it is important to understand the "feel". Another fun bread to make is pita. The best tip I've received so far, because I've only started baking bread recently, is to learn to do a simple bread before starting into off the wall recipes. A simple loaf of bread is easier to read (more flour, more kneading?) than a super crazy dill and cottage cheese bread. Honestly, I think the books you listed are your best tools in the kitchen. Bread baking in particular is a hobby AND a sport. I love Reinhart's The Bread Baker's Apprentice. I swear by his cold rise method. Have you TRIED his Napoletana pizza crust? Holy cow! Anyway, once I read up on and understood how different ingredients interact with one another (for example, why you need both an acid and a base in bread dough and what they contribute to taste, texture and mouth feel), I felt much more confident to take on the harder recipes. Ground yourself in the basics and before you know it, you've got a reputation and people want you to teach them how to make stuff. I kid you not. I had 16 people show up at my house to learn how to make yeast cinnamon rolls once. I expected three. Good tips! I am looking into the last book since it might be the easiest of all. I have made a loaf or two a few times and its time I start again. I was wondering if you have ever made tomato bread? Also how your garden is coming along? Ok, so acknowledging a certain inconsistency in my cookies undoubtedly from the casualness of my measurement, I took your advice and bought a scale. Now how do I convert my recipes to weight rather than volume?